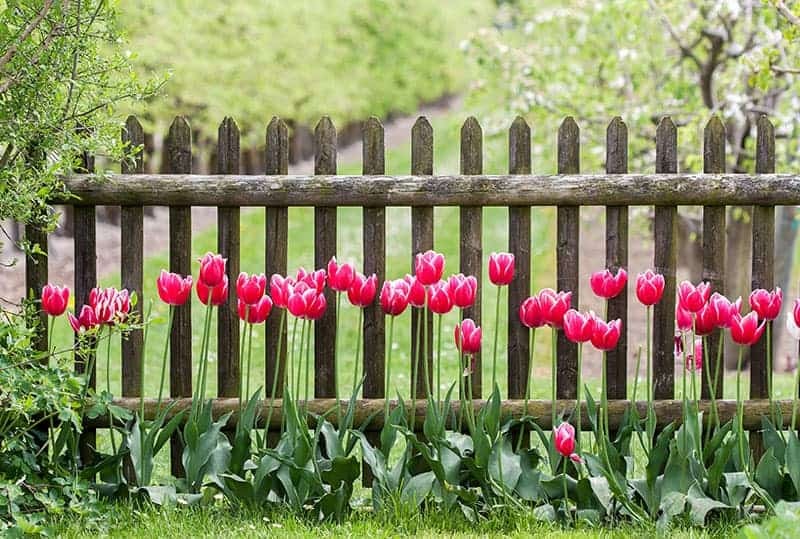 Garden fences serve a multitude of purposes, including preventing theft from yards or nibbling from your crop, providing privacy for you and your family, creating shelter for plants, keeping pets and children safe, and helping to create curb appeal for your property. Whether installing a new fence or looking for inspiration to update an existing fence, the excess of options can be overwhelming. That’s why we’ve narrowed down the best 25 garden fence ideas to help you with your choice. This medium-height fence is perfect to create a border around your yard without completely blocking out your neighbors and your view to the outside world. The gaps between each vertical plank help to increase visibility while also keeping out wild animals. This type of fence can be purchased from a hardware store, or you could have one commissioned by a carpenter. 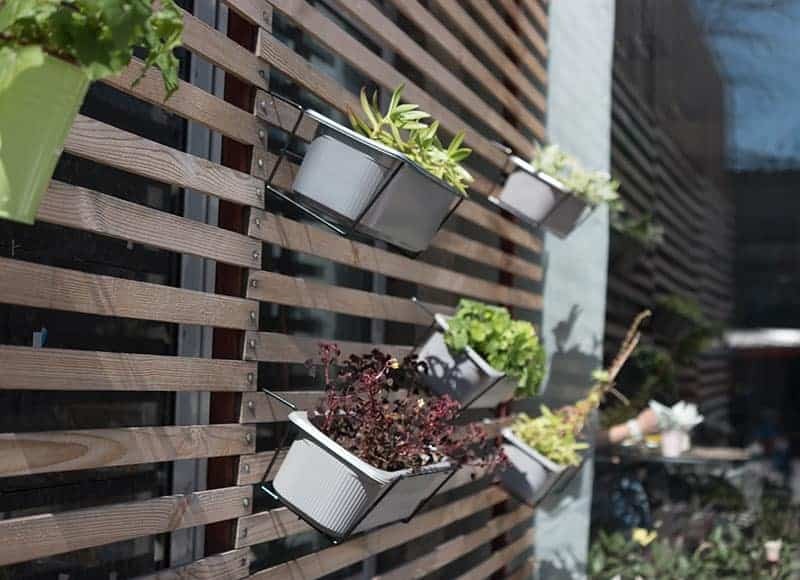 It provides a stylish, open, yet protected appeal to your garden. 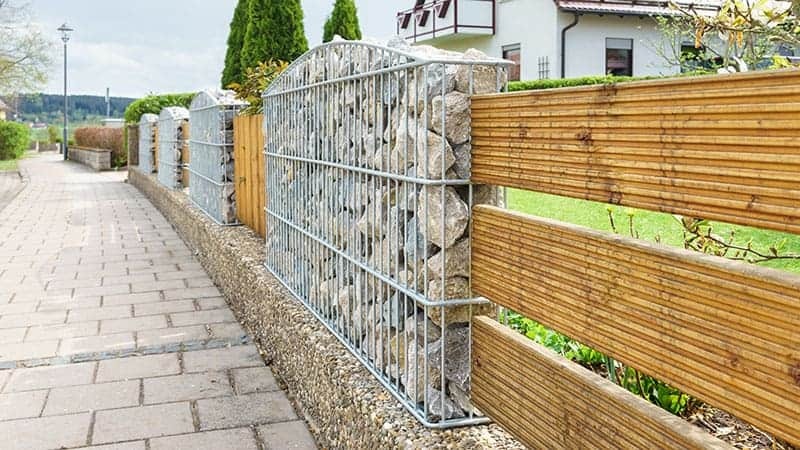 Gabions are a cage-like construction filled with large pebbles or rocks and can be used in place of a fence or brick wall around your property. They have a modern industrial look and are extremely solid, giving the impression of quite an intimidating barrier around your home. 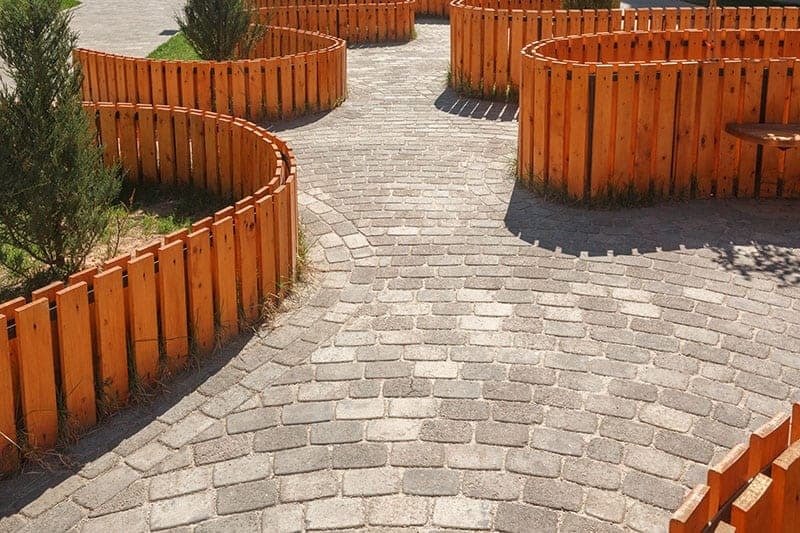 You can break up gabions, as shown here, with wooden fencing in between. Deck planks have been used here, creating a contemporary look. It’s perfect for those who like to showcase a unique, upscale style. Fences are typically thought of as being constructed of wood, but metals can make very striking fences. This iron fence is an ideal example, oozing opulence and class. 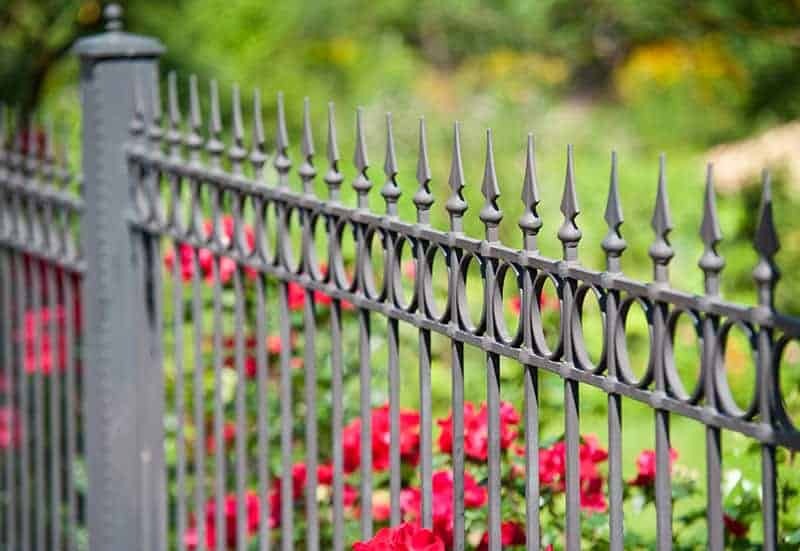 If you like the idea of an iron fence, there are many designs to choose from, ranging from basic utilitarian style fences to intricate and elaborate styles. The benefits of metal fences are that they are extremely hardy and long-lasting, and fare better against extreme weather than their wooden counterparts. However they do lack privacy, so often work better for front lawns. If you want to use them for your garden, make sure to get one with narrow openings between the bars. 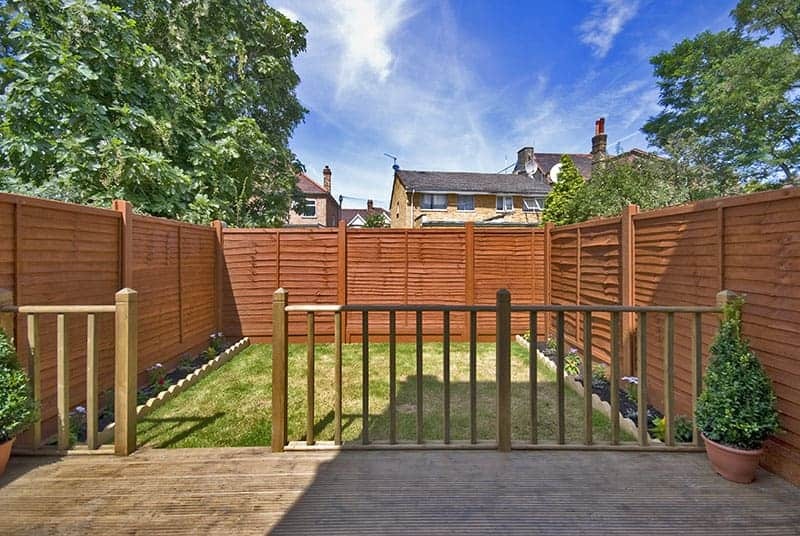 Separating your garden into two parts with the use of a fence can help to define areas for different uses effectively. For example, you could define a decking space as an outdoor dining area, or a lawn as a children's play area. If you have pets who you want to keep off your lawn, a partition fence within your yard is a good solution to physically prevent animals from getting to and destroying your lawn. In this instance, low-height, wide-planked fences work best, separating your garden into sections without creating too much of a visual barrier between the areas. Garden fences are not just a means of creating a barrier between your land and the outside world; they are also a useful tool to implement a landscaped look. Using miniature fences of only a few inches in height around flower beds or vegetable plots gives a professional effect for very little expenditure. 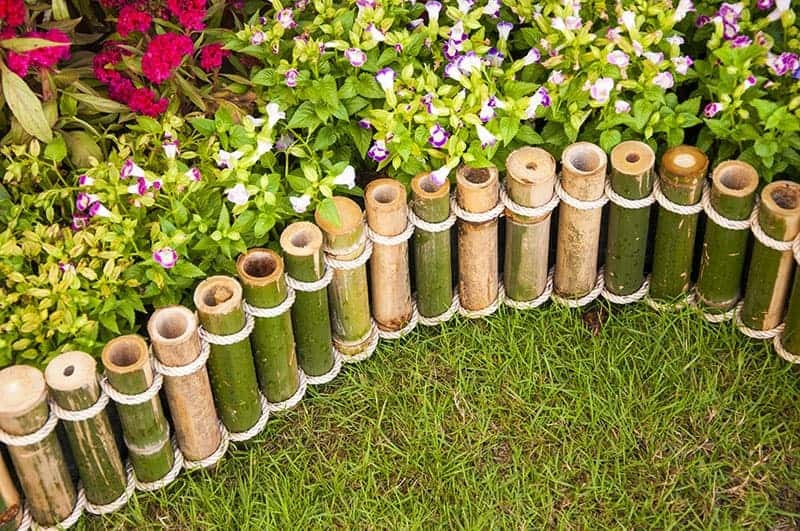 These types of mini fences are often made from bamboo of other types of wood and are flexible with the ability to be curved alongside any flower bed shape you may have. You can create these types of fences yourself in any style you prefer. Use raw wood or finish it for the most complementary look in your yard. Fences often come adjoined to garden gates, but few people think about making a feature out of the entryway. An archway such as the one shown here adds real character to a property, giving it great curb appeal. It looks simultaneously opulent and quaint and doubles up as an extra place to grow flowers. 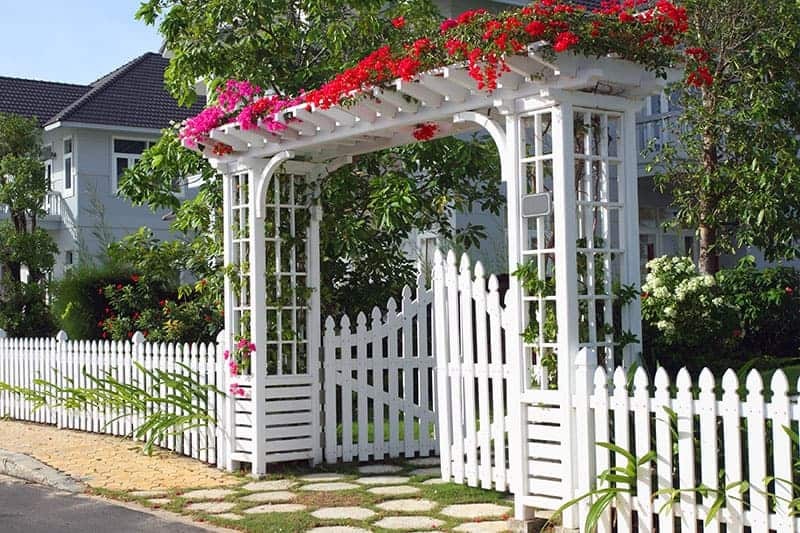 Painted in white, archways in fences are classic and timeless and can be bought in almost any size. You can also construct your own archway out of limber branches for an ultra-natural look. Utilizing a trellis as a fence is a very low-cost way of creating an enclosed backyard. As well as being inexpensive, trellis panels are good for optimal visibility, as well as for supporting climbing plants. Their main drawback is that they are not especially sturdy, and often splinter or completely break in places during storms or when put under pressure. You will need to fix the trellis to fence posts at each panel joint for stability, but even so, expect to have to replace them every few years. The good news is that it’s easy to do so as part of your spring or fall maintenance. 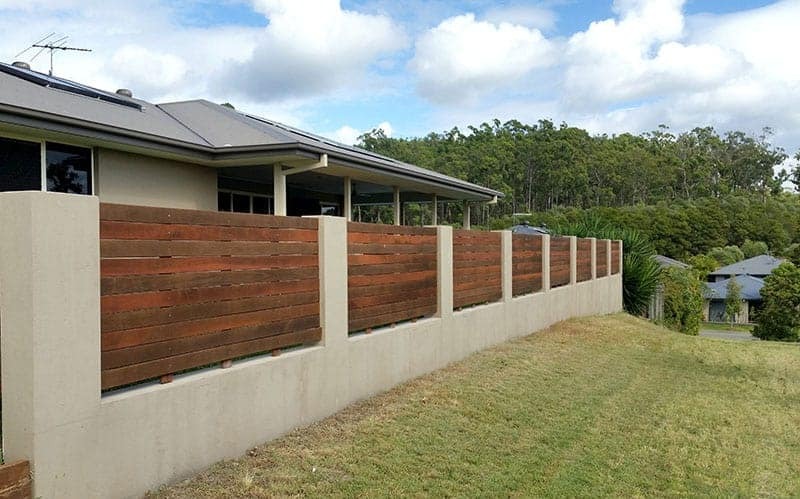 If a full timber fence isn't your thing, combine different styles of fencing by fitting wooden panels amongst walls. The rendered walls seen here have been specifically designed and constructed to hold timber panels between each column, and the resulting look is one of quality and style. 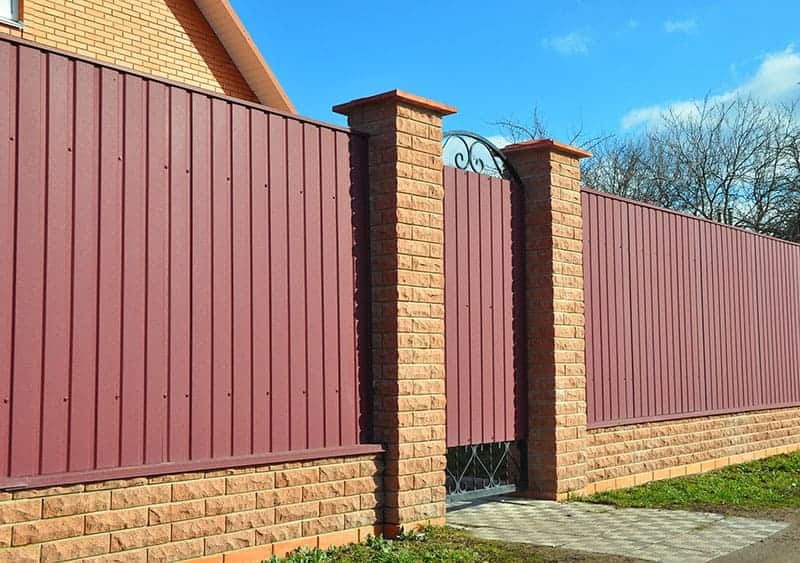 Though this type of fence is likely to take more time and cost more money than a standard fence, it's a great way to give a customized, unique look to the exterior of a property. If you're looking for an ultra-low-cost fencing solution and enjoy turning your hand to DIY and crafting, then a homemade wood and wire fence could be the one for you. All you need is a selection of wooden offcuts or even a bunch of branches which are fairly straight and all cut to a similar length. These wooden stakes or branches can then all be secured together with some flexible, sturdy wire. Wrap the wire around each branch before moving on to add the next one, and repeat the process at various points along the length of the branch for increased stability. It will give your fence a homey, rustic appeal. Wattle fence is constructed using the ancient craft of weaving coppiced branches through wooden stakes. While you can buy wattle fence from specialty tradesmen, it may be cheaper and more enjoyable to make your own. 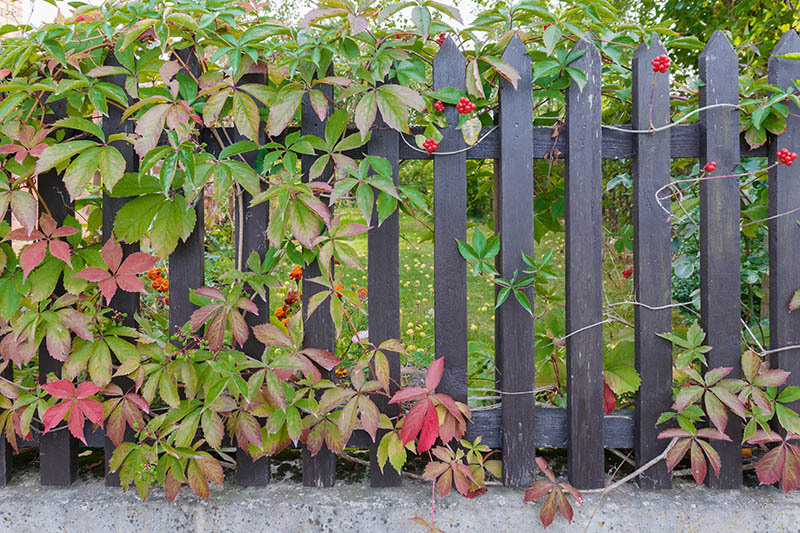 A thicker branch will form a sturdier fence, while a tighter weave will also increase strength and lifespan of the fence, as well as producing a more solid appearance with fewer visible gaps. The finished look is quite rustic and would look fitting surrounding an old country farmhouse. People have various reasons for installing fences around their property. Some like to keep pests out, while others like to keep pets or children in. Whatever your primary reason for erecting a fence, consider what secondary uses you may have from it to help you determine your ideal fence. If you're fond of plants, flowers, or herbs, this fence which doubles up as a unit for hanging baskets from may pique your interest. Some fences also have multiple functions, such as those which come ready fitted with solar lights, or feeders to attract birds and wildlife. Whether you're installing a new fence or looking to breathe new life into an existing fence, using paint is an inexpensive means of creating a big transformation. One type of paint that is often overlooked and rarely used for outdoor fences is gloss paint. This paint has a high shine finish and is generally more durable and long-lasting than other finishes. It is usually oil based and can be wiped clean. 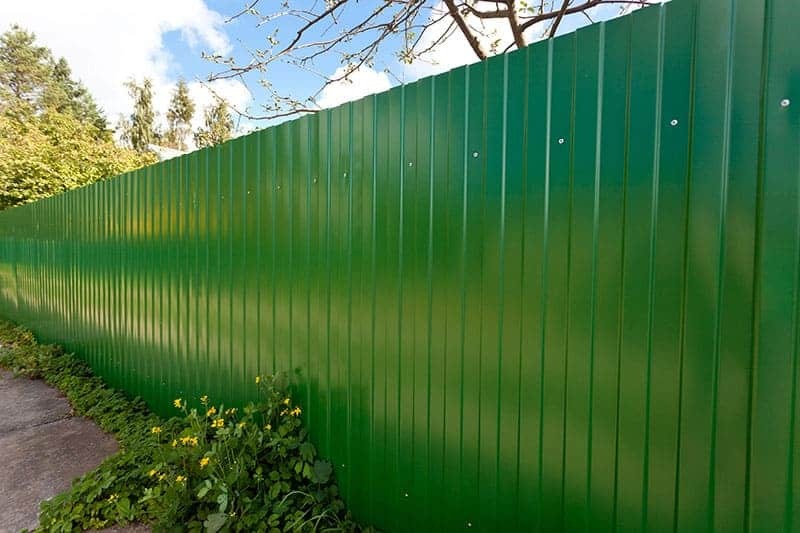 A gloss paint job on your fence will add a modern clean-looking style to your outside space, and will also increase the lifespan of your fence, better protecting it from the weather. 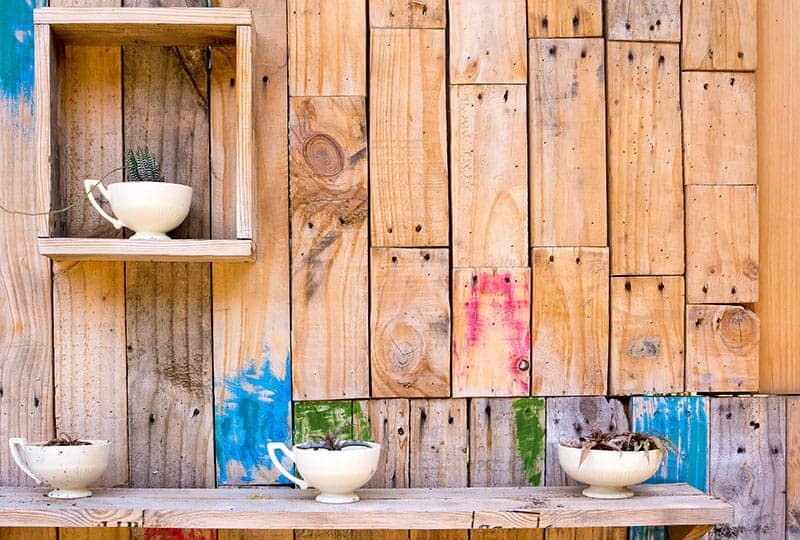 If you've ever browsed Pinterest you'll know them you can seemingly make anything out of a few old pallets, and garden fences are no exception. Pallets are actually ideal to repurpose into a fence, as they are already a large, solid construction, and simply need fixing to fence posts to create a row of fencing. By simply adjoining pallets, you can easily and inexpensively build your own DIY fence, but what's more, pallets have inbuilt shelves and cubby holes with which you can customize your fence. 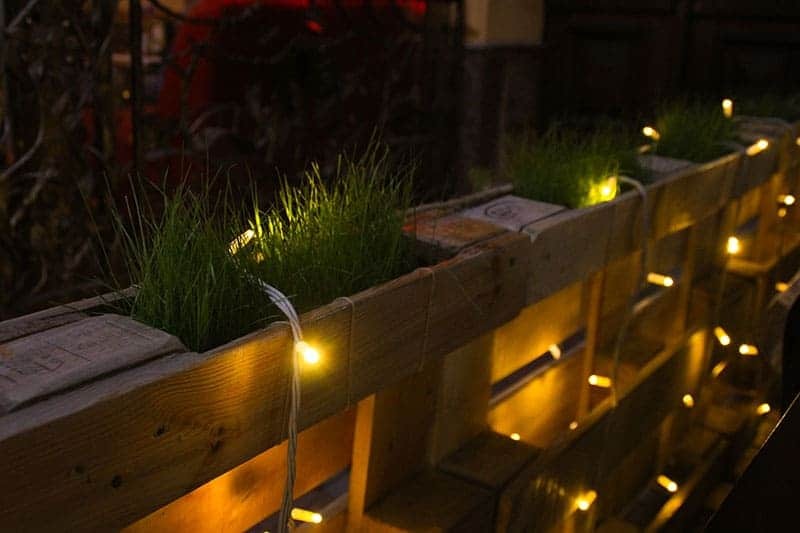 Use the gaps in your pallets to house plants, or drape string lights or garlands around the planks. You can create a very natural look by allowing your vining plants to use the pallet for support and grow out between the planks. If you're happy to take on a big project for the sake of saving money, you can deconstruct old pallets and use the planks to build new fence panels from scratch. Though this would likely be quite time-consuming and labor-intensive, the resulting look would be charming and rustic. Another benefit of this is that you would be repurposing old wood which would otherwise likely be used as firewood or destroyed, thereby making your fence eco-ethical and sustainable. If you have a worn looking fence which is past its best, you can give it a new lease of life with a lick of paint. Slightly aged fences look great in pastel colors, as these lend themselves to rustic, homey styles. Painting a fence is a job that can be easily achieved in a weekend, and requires no professional help. If you’re going for the rustic look, then you don’t need a polished finished, and therefore it won’t be noticeable that you’re an amateur painter. Painting your old fence also helps to prolong its lifespan, giving you a few more years before you need to replace the fence. Don’t be afraid to stand out from the crowd and let your personality spill over onto your decor, both inside your home and outside on your property. 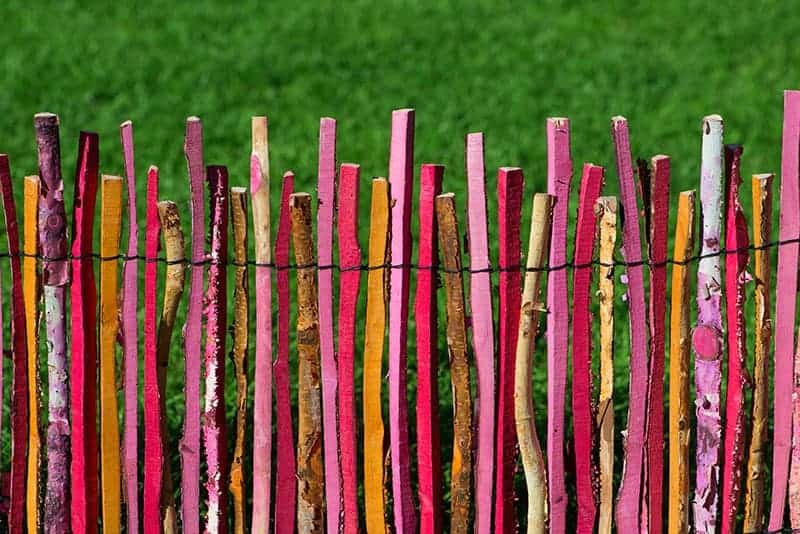 If you’re a fan of the quirky and colorful, there are an unlimited number of ways you could get arty and creative with your garden fence. Brightly colored fences can give a facelift to your homes curb appeal, bringing a ray of sunshine to your street. Colorful fences work particularly well in coastal towns, which are traditionally more experimental with color. Garden fences, due to their size and plain nature, are the perfect canvas for works of art. Set your inner artist free and make a statement on your fence, either on the inside to enjoy while you lounge in your yard, or on the outside to interest passersby. This painted flag is just one example of a customized fence, but the options are endless with the only real limitation being your imagination. One fun way to style your yard is by coordinating the colors. This garden fence has been painted in a hot pink, which matches the herb planters, making it look quirky and individual. If bright colors aren’t your thing, you could achieve a more subtle yet equally stylish look by painting your fence and planters in a matching black or gray charcoal colored paint. This simple idea can achieve an effective look with minimal cost and effort. For a completely original and unique garden fence, build one yourself from scratch. You can buy all of the required materials from hardware stores, such as lengths of timber, fence posts, screws, and nails. 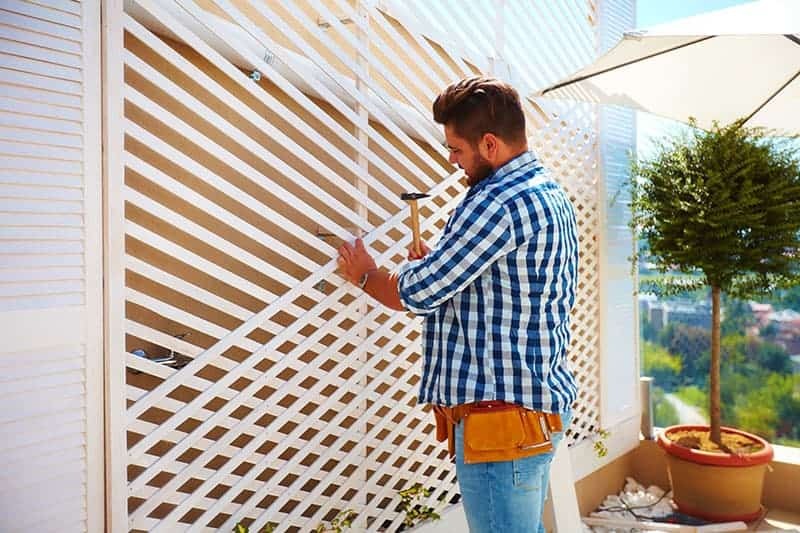 By building your own fence, you can completely customize the size and style, creating a pattern such as lattice or crisscross. If you are reasonably handy, you should be able to construct your own fence without too much trouble, making use of handy tutorials on YouTube. Failing that, call in a favor with the DIY enthusiasts among your friends and family to help. A fence built from logs can achieve a traditional Scandinavian look, reminiscent of wooden log houses and cabins in the snow. For a more rustic finish in the style of a children’s treehouse, logs can be used in a number of ways. If you are fortunate enough to have access to woods where you can chop your own trees down, constructing your own fence is an excellent use of logs. You can also use logs to create a “fairy” fence by incorporating plenty of lawn decorations on top of and at the base of the logs. Mid-height fences around specific areas of your yard can serve as protection for your plants against footfall, pets, and children. They also work to create footpaths amongst your garden beds, setting out defined areas which almost become corridors in your yard. For this type of project, select flexible fences that can be shaped to fit around your existing flower beds. Choose landscaping green to blend in, black for a subdued look, or white to complement the colors of your flowers or trim. Grander homes will require more imposing looking fences to match the style of the property. For a stately looking fence, a high shine polished chrome fence such as the one pictured here looks both modern and regal, suggesting an air of opulence without being old fashioned. To maintain the high-quality look of this chrome fence, remember to keep it clean and free of debris throughout the year. White vinegar works as one of the best types of cleaners for metal fences, causing no harm to the environment while also being low cost and resulting in a sparkling finish. 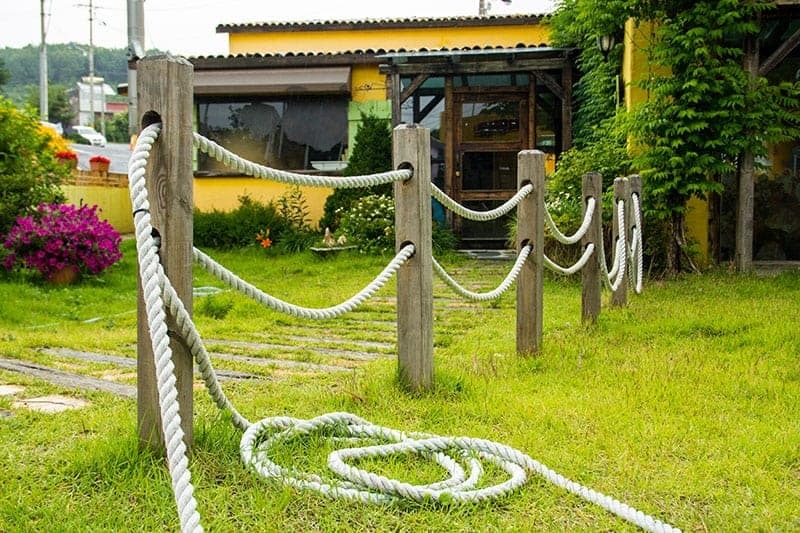 A rope fence can be strung together in a matter of minutes after the fence posts have been fixed into position. This type of fence serves as a reminder of the property line around your home more than anything else, allowing you and your neighbors to easily distinguish where your property ends and theirs begins. A rope fence is both low-cost and low-maintenance and looks particularly at home in coastal towns where a seaside theme is prevalent. Sheet metal fences are ordinarily associated with use as protective fences around commercial units, having an industrial look to them. However, a trend has started to take off of utilizing sheet metal in garden fences amongst homeowners. This low-cost material is strong, long-lasting, and fits well with the modern minimalist style of many new homes. 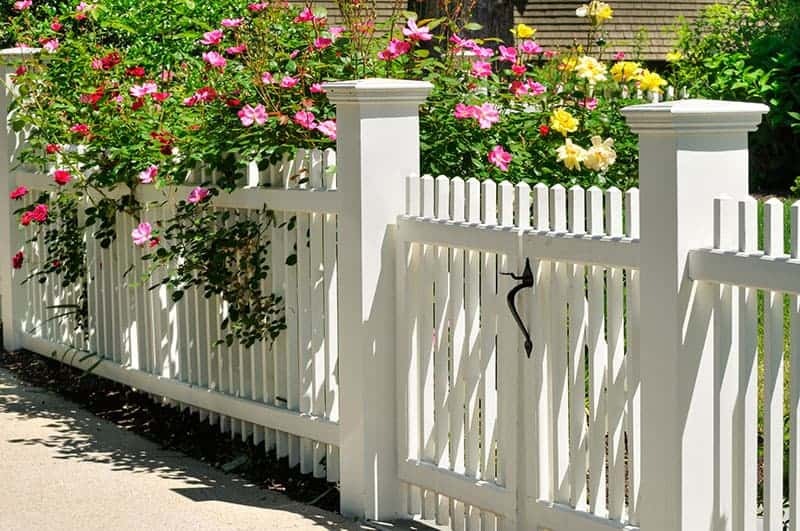 A traditional white picket fence is a long-standing favorite choice of a garden fence for a good reason. It looks classic, elegant, and homey, and suits a variety of property styles. This medium-height fence works perfectly to create a non-imposing border around your property, and the bright white color helps to set off the greenery of plants or lawns sitting around its base. 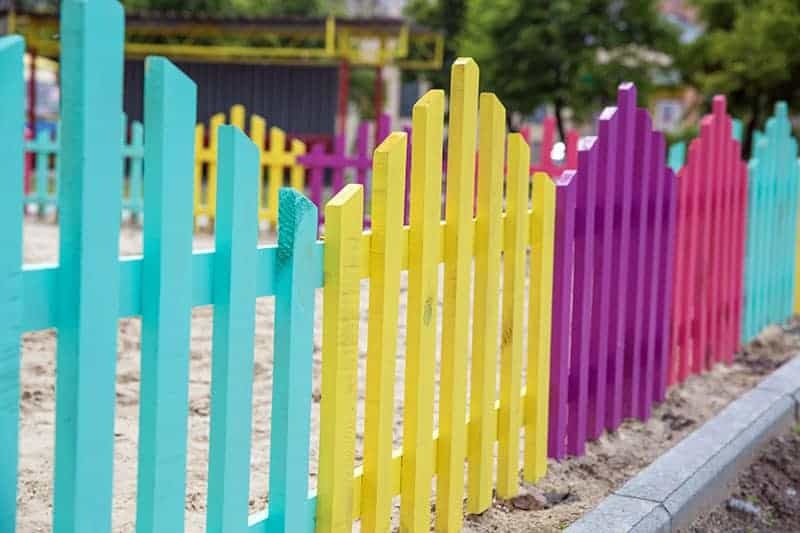 This neighbor-friendly garden fence also allows you to keep in contact with passersby whilst out enjoying your yard, encouraging communication and maintaining community relationships. Garden fences are an important part of our home’s identity, as well as serving the important function of keeping our plants, family, and pets safe. It’s important to consider the primary purpose of your fence as much as you would consider your fencing budget and your ideal aesthetics of the fence. If this list has helped you to select a type of garden fence, then please share it to help others. All comments are welcome below.